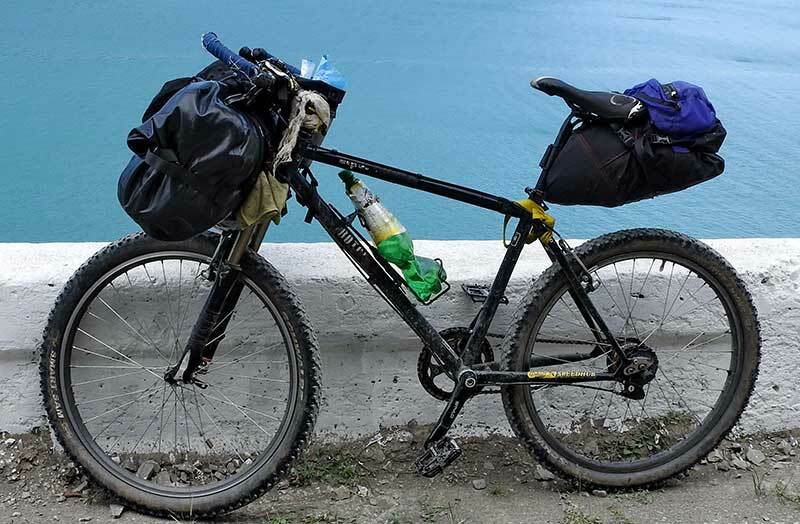 This front rack did not survive the trip to Mongolia. 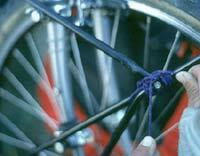 It broke at the joint and we fixed it with some rope. 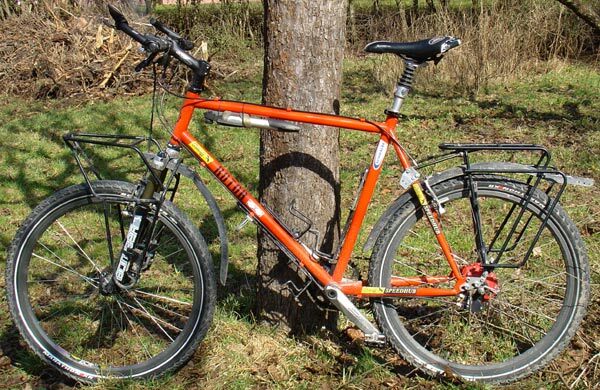 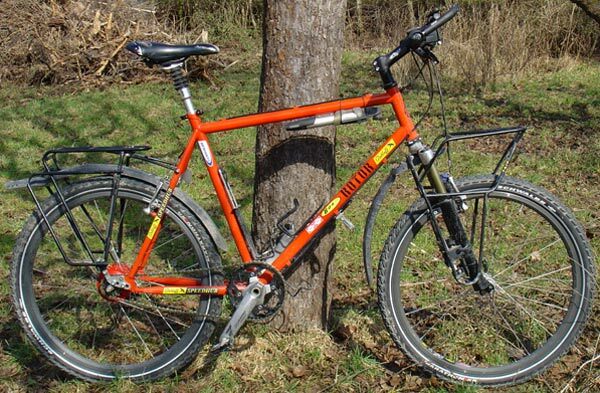 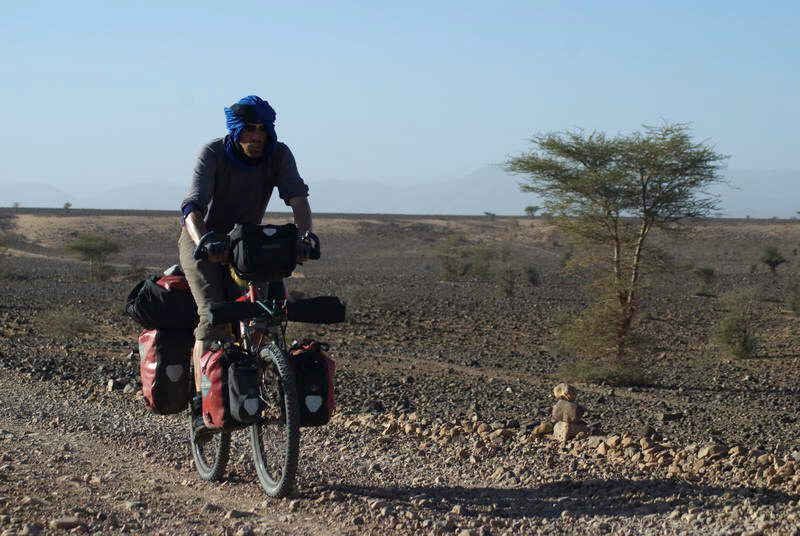 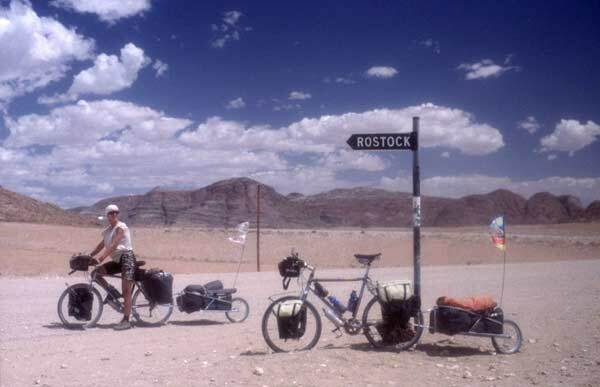 This front rack also did not survive the Mongolian roads - we traveled with self-made ones afterwards, and now use the Faiv Hoogar in combination with suspension forks. 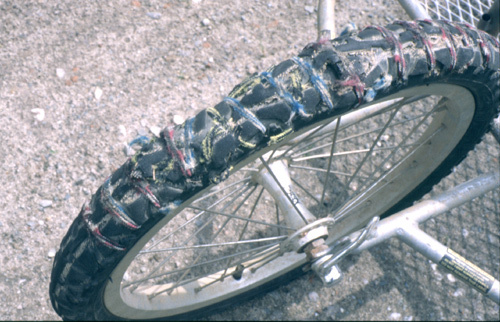 The original tire of the early editions of the BOB Yak trailer. 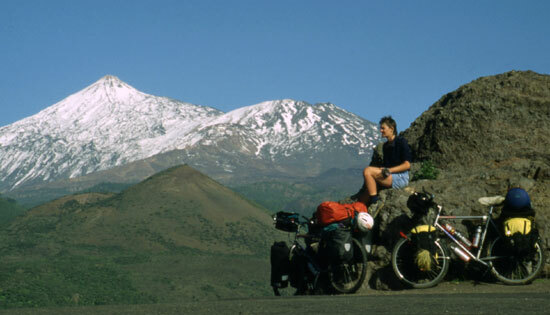 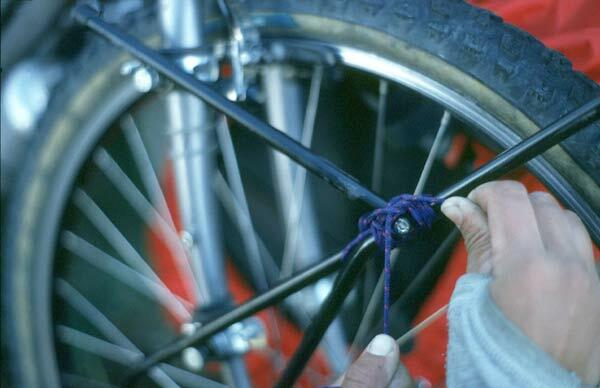 The profile was gone already after 500 km in Mongolia... A lot of inventive mending was necessary. 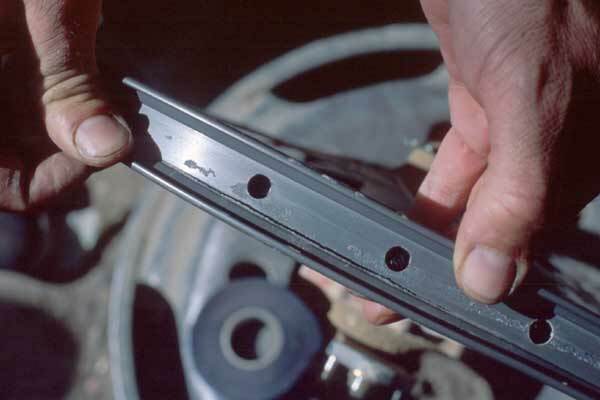 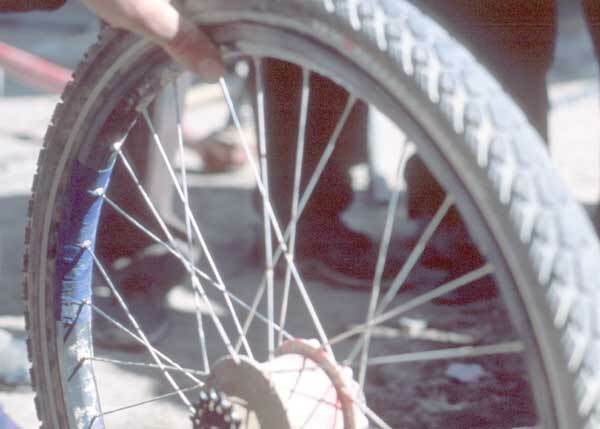 Flat tires - there are a few on almost every tour, usually not a big deal. 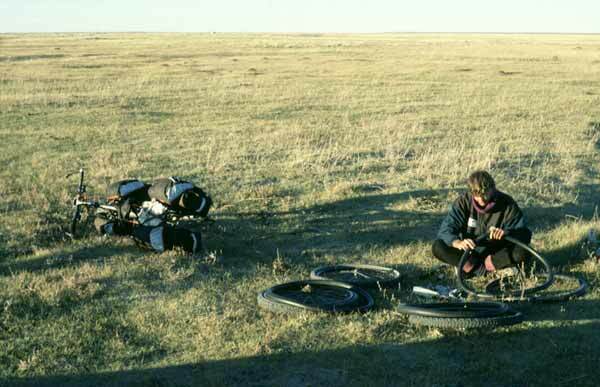 However, in the Mongolian steppe we had 4-at-a-time (small hard thorny seeds of some plant). 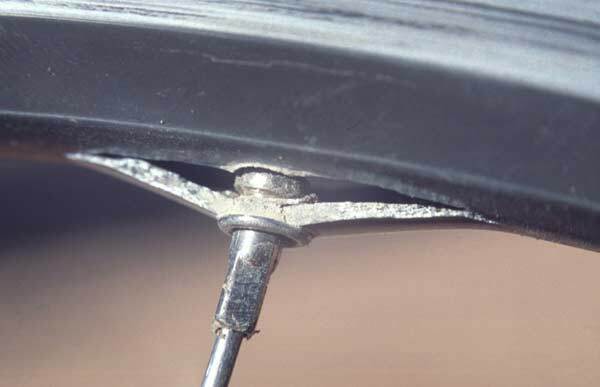 Rim Mavic 517 - not suitable for touring. 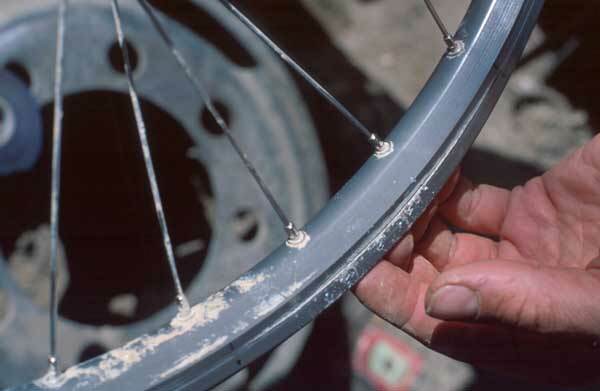 After 4000 km through Namibia and Botswana the spokes ripped out of the rim. 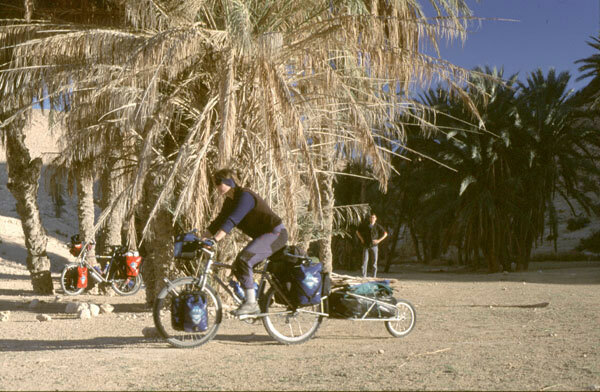 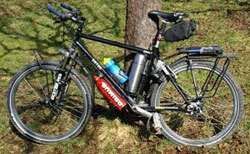 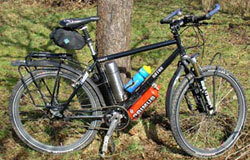 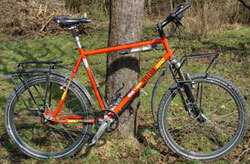 A modification of the "classic" way, which adds the trailer instead of rear panniers to one of the bikes. 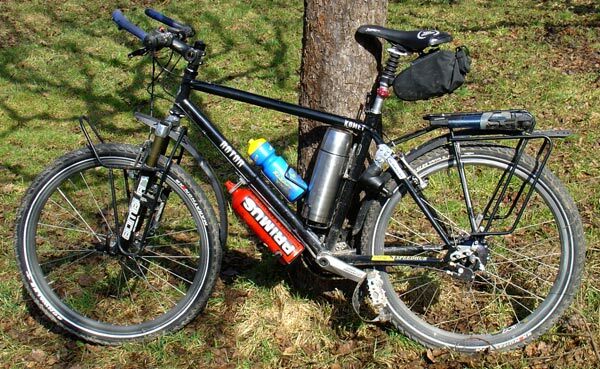 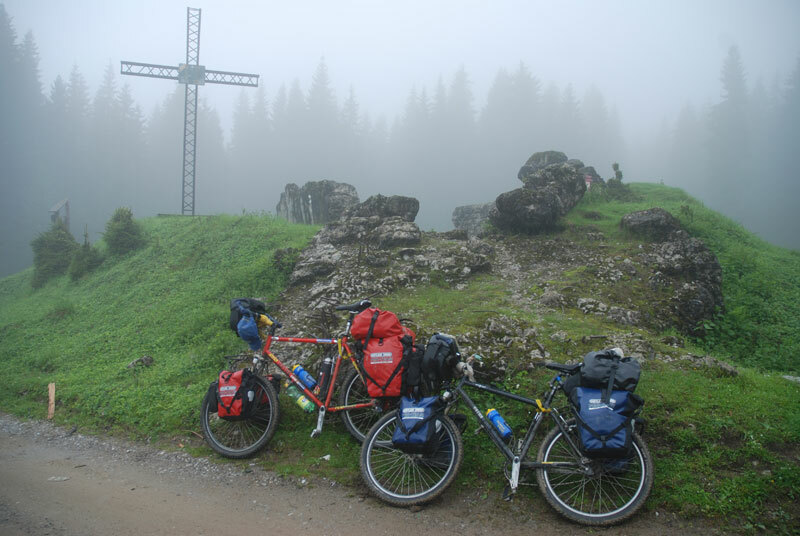 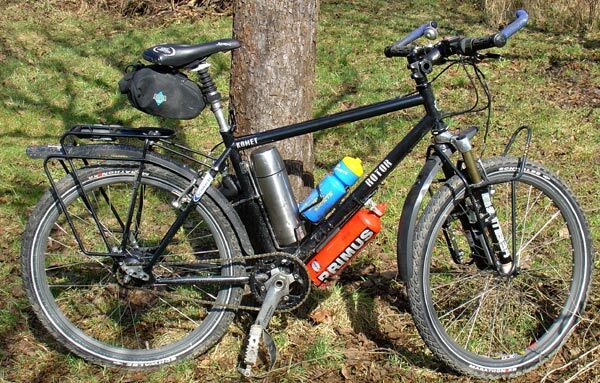 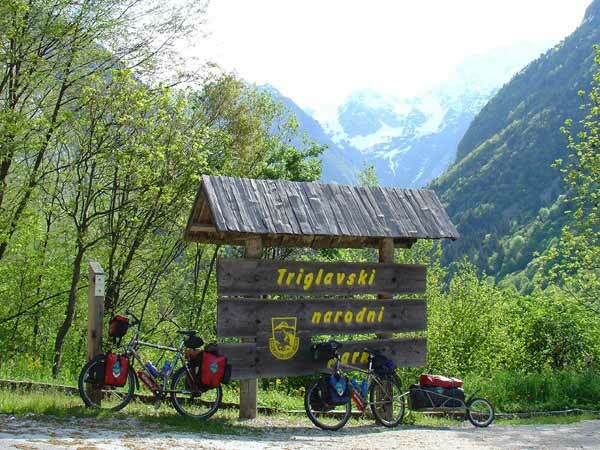 The combination of front panniers and trailer is quite nice, as the low center of gravity results in a very good riding stability also on small trails and mountains. 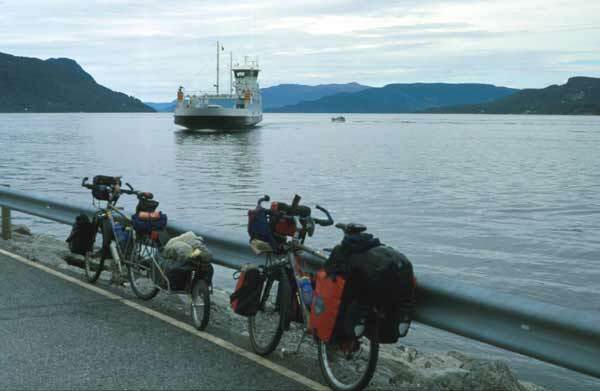 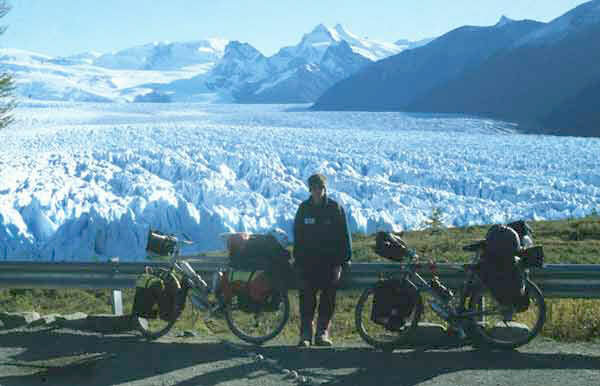 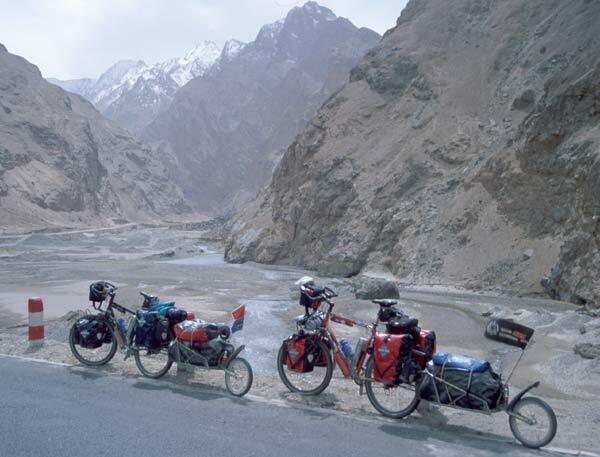 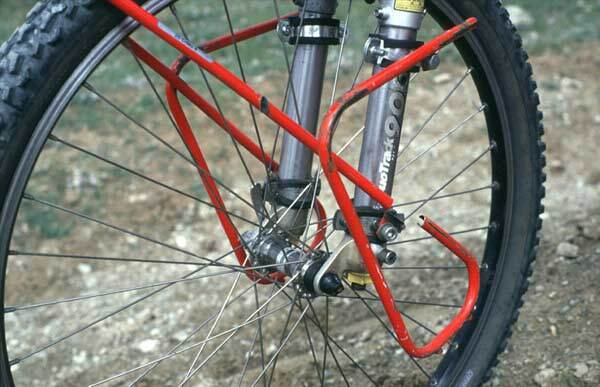 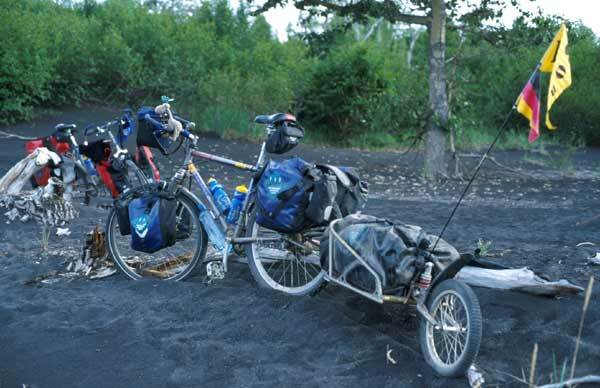 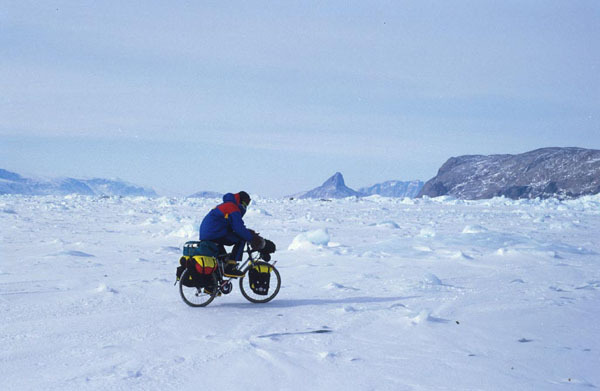 The trailer increases the capacity of stuff that can be taken along, while the center of gravity of the loaded bike remains lower than with huge stacks on the rear rack. 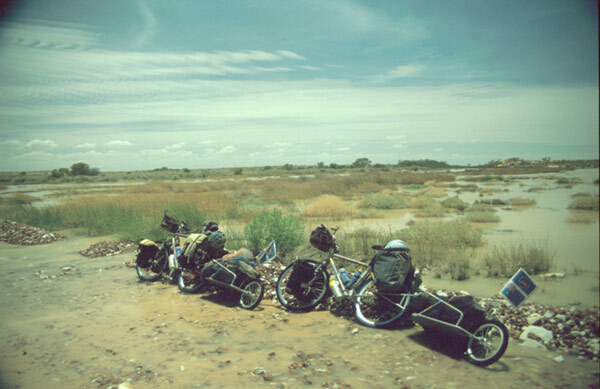 This system is of advantage when traveling to places where not much food or water is available.